Montreal mayor Camillien Houde publicly urges Quebecers to not sign up for national registration for war duty. Lord Beaverbrook appointed to War Cabinet. French military court sentences de Gaulle to death in absentia. Italy reported to be massing troops on Libya-Egypt border. British Royal Navy bombards Italian naval base on Sardinia. US and USSR agree on US aid. All radios in Norway are confiscated. Soviets blow up a huge Japanese fuel and ammunition dump at Tatutzuchuan in Eastern Manchuria. US Office of Production Management seizes silk supply and takes control of silk industry, restricts use of rayon, reserves steel for government use only. The British convoy, code-named ‘Pedestal’ leaves Britain for the strategically-important island of Malta in the Mediterranean. The convoy consists of 14 fast merchant ships loaded with fuel, food, and ammunition. The convoy is accompanied by 2 battleships (Nelson and Rodney), 3 aircraft carriers (Victorious, Indomitable, and Eagle), 14 destroyers, and 3 anti-aircraft cruisers. 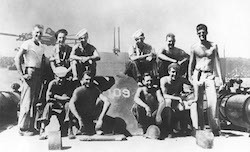 PT-109, commanded by future president Lt. John F. Kennedy, sunk off Solomons by Japanese destroyer Amagiri; the survivors swim 4 hrs to a deserted island. The ninth attack on Hamburg in eight days. More bombs have now been dropped on Hamburg than on London during the whole of the Blitz. Estimated 50.000 killed, equal to Britain’s entire civilian losses by bombing in the war so far. Hitler orders that German armies are to hold fast in Russia, but Manstein ignores him and uses a flexible defense in the Kharkov sector. The Russian gains around Orel continue., but German forces repel massive Soviet attacks at Izyum and the Mius river line. Two hundred Jews escape from Treblinka extermination camp during a revolt. Churchill makes a statement to the House of Commons and says after seven weeks of non-stop V1 attacks, 5,340 having being launched, that 4,735 have been killed, 14,000 injured and 17,000 houses completely destroyed. The U.S. VIII Corps moves West from the Avranches area along the Brittany coast, but the main force drives eastward. Turkey ends diplomatic relations with Germany. The First Polish Army gains a Vistula bridgehead, 40 miles to the south of Warsaw. Potsdam conference ends after more than two weeks of deliberations. Allied leaders have been discussing what should become of Germany. US B-29s drop 6000 tons of bombs on Nagasaki and Toyama, Japan. Japanese suffocate 387 Allied POWs in mine on Sado off Honshu.